James Franco talks to Festival Director Kathy Beeck on arrival. Long-time BIFF attendee Bonnie Chaim was there for most of the weekend with her camera as well -- in addition to providing us with the best shots of Oliver Stone in action, she produced a nice spread of exposures. 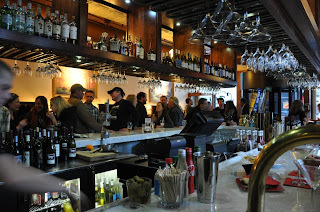 Here are some! Thanks, Bonnie! Franco looks momentarily overwhelmed by his rousing reception at BIFF. Franco chats with BIFF's Ron Bostwick. 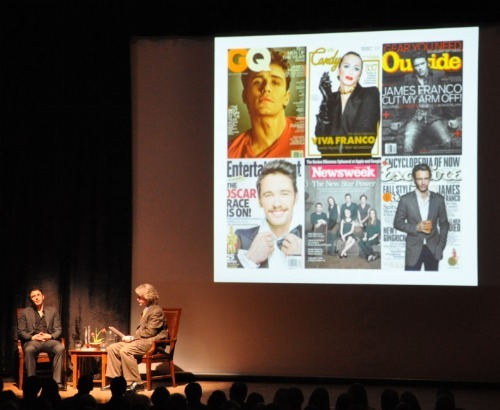 Franco checks out his recent slew of magazine covers. Writer Jeanine Fritz (right) and friend on Saturday night. 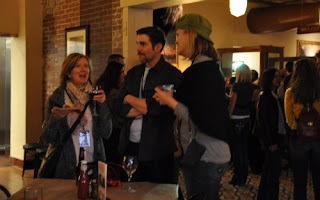 VIP Filmmakers Reception at Ted's Montana Grill. Community Marketing Co-ordinator Mary Ann Williamson (left) and Program Assistant Robyn Schauweker (right) chat up a guest at BIFF's VIP Filmmaker Reception. Nobody ever gets a picture of him! 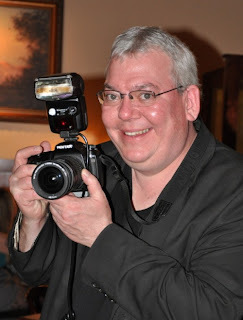 It's our intrepid BIFF photographer Randy Malone, who never put down his camera, even during cocktail time. U.S. Representative John Lewis (left) is interviewed by Ron Bostwick after the screening of "Freedom Riders." 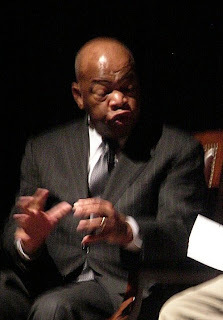 Congressman Lewis makes a point during his interview. 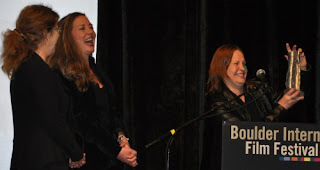 The big finish: the awards table, and Kathy and Robin at the podium. Director Christophe Fauchere and producer Joyce Johnson pick up the award for Best Colorado Film for their movie "Mother." 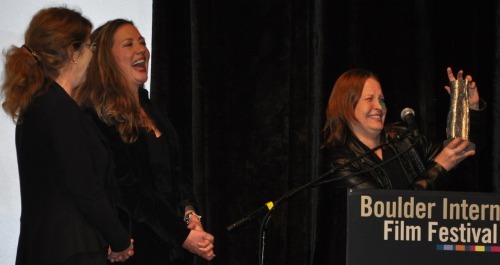 Jen McGowan cracks a joke as she accepts the award for Best Short Film for her movie "Touch." Howdy! It's Oliver Stone, with Robin. 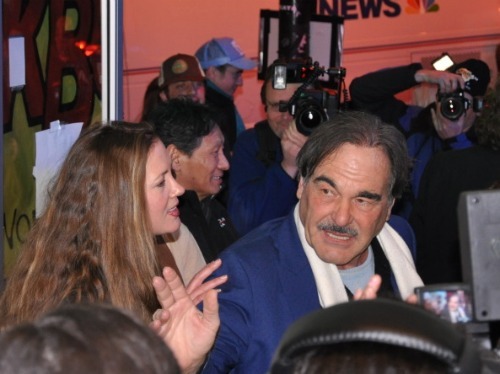 Robin Beeck and Oliver Stone negotiate the media frenzy as he makes his way into the Boulder Theater. 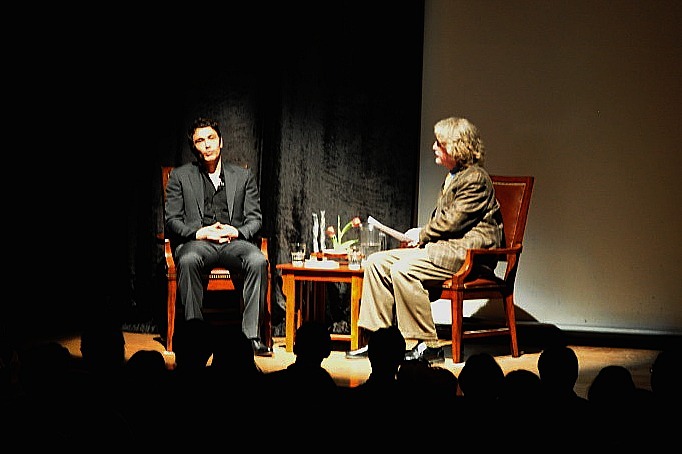 Aron Ralston (left), whose experience was adapted into the Oscar-nominated "127 Hours," gives the Vanguard Award to honoree James Franco, who plays him in the film. Randy Malone has been BIFF's go-to guy for complete photographic coverage of the festival since its very beginnings. 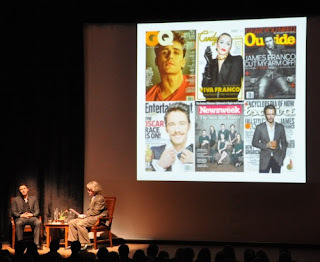 Here's a look at just some of the magnificent images he captured over the course of BIFF 2011. 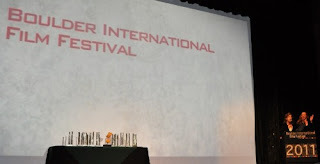 To see all of his BIFF pictures from the festival go to http://www.photomalone.com/ and click on the 2011 Boulder Int'l Film Festival link! Thank you, Randy! The Opening Night crowd packed the Boulder Theater. 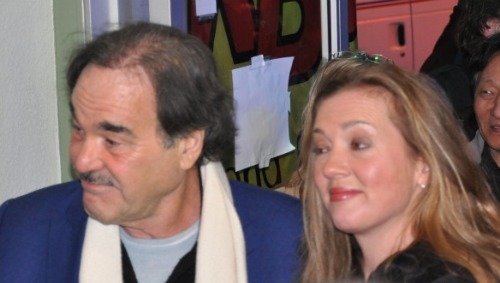 BIFF Executive Producer of Special Events Ron Bostwick (center) after his onstage interview with Opening Night guests, "Troubadours" director Morgan Neville (right) and producer Eddie Schmidt (left). 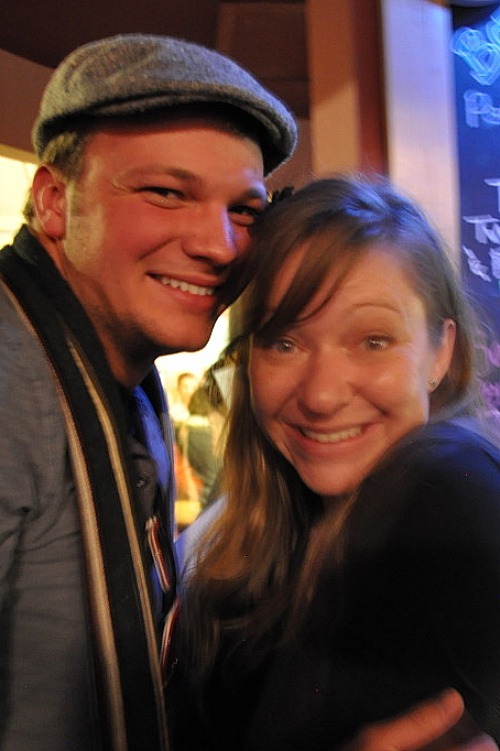 Boulder animator and Mighty Fudge studio owner Pat Mallek. Comedian Henry Phillips, who wrote and starred in "Punching the Clown." 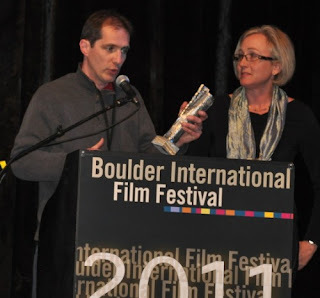 Producer Joyce Johnson and director Christophe Fauchere, whose "Mother" won Best Colorado Film Award at BIFF 2011. 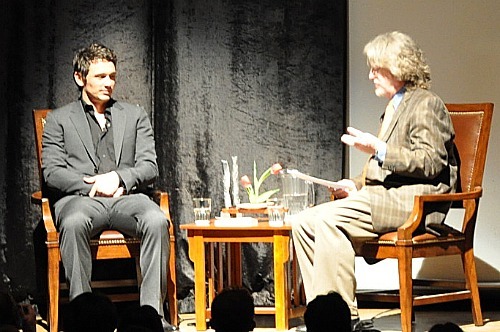 The crowd gets all antsy in the pantsy for the arrival of James Franco on Saturday night. 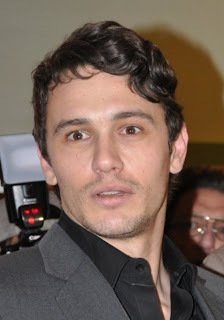 Robin Beeck, James Franco, Kathy Beeck. Hey, when did we get the laminate backdrop with our logo on it? Su-weet! Congressman Jared Polis introduces the Boulder Theater screening of "Freedom Riders" on Sunday. 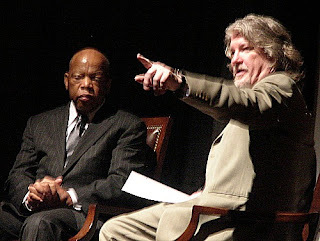 Freedom Rider and U.S. Representative John Lewis, who joined us for "Freedom Riders." Congressman Lewis shared his time generously with the admiring crowd. Onstage Sunday night, Oliver Stone grasps his Master of Cinema Award, flanked by festival directors Kathy Beeck (left) and Robin Beeck (right).